Last year I picked up a Caudalie mini kit in France (review link) so I have been interested in trying more products from the brand. 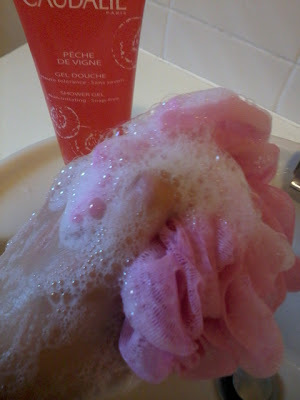 Since the Beauty Exlixir does not appeal to me I decided to change things up in the bathroom and switch shower gels. 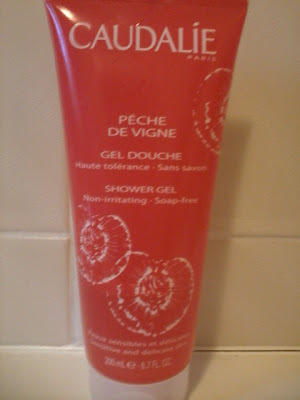 I purchased Caudalie Pêche de Vigne Gel Douche aka Peach Shower Gel (£9 for 200ml). Ingredients are derived from plant origin and free from parabens, phenoxyethanol, phthalates, mineral oils, SLS and animal ingredients. I also received with my order a free sample of Crushed Cabernet Scrub. I have only tried this once. It is fairly abrasive so I would not recommend for delicate skin. I notice on the website it claims to have "slimming action". This is not something that interests me but I am sure others out there will be keen to give this a try. The full size does comes with a hefty price tag (£21.50). Have you tried these products or any others from Caudalie? Amendment 03/08/12 - It has been announced that Caudalie have been ban from using the BUAV Leaping Bunny Logo as they plan to sell in China. I feel very strongly about this and will no longer buy or support the brand with reviews. Click here to read an article from The Independent on this subject. The scrub does interest me a little because I prefer rougher scrubs as most do nothing for my skin!